Attended a beautiful farmers market last week in Chicago’s Daley Plaza and bought a bunch of great stuff that we grilled that night on our patio. The array of vegetables and other treats available at this market was impressive. Only a few of the merchants accepted credit or debit cards, though, which means we couldn’t give our money to a lot of earnest farmers who had such excellent produce for sale. Lucky for us, there were some earnest farmers with equally excellent produce who also lived in the 21st century and were able to take our money for their goods. Commerce! Yes, the merchants who didn’t accept plastic avoided a small transaction fee, but they also avoided an entire sale (and judging by the number of people using credit or debit cards at this market, they avoided a lot of sales). 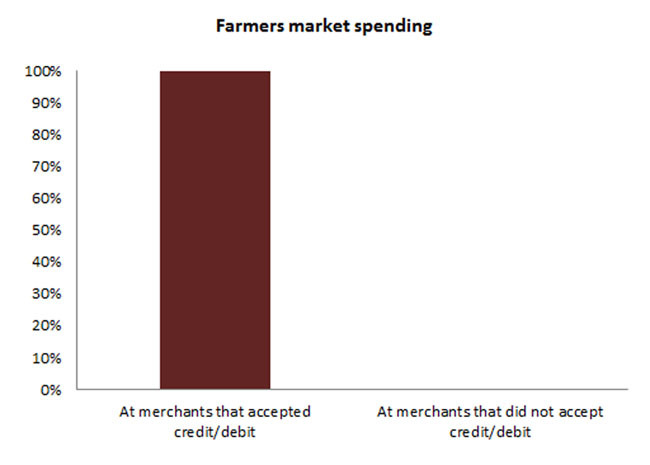 For people who are more visual, here’s a chart illustrating the percentage of money we spent at merchants who accepted our cards compared with merchants who didn’t. One hundred percent of the money we spent at the Daley Plaza farmers market went to merchants who accepted credit/debit cards. Merchants who accepted cash only (or checks!) earned zero of our dollars. This topic has come up before, of course, with Kimball’s Peak Three Theater in downtown Colorado Springs. A few years ago, a theater rep snidely told us and the Colorado Springs Independent that “cash is king.” But it looks like cash has been dethroned, since Kimball’s now takes credit cards. Welcome to the future, Kimball’s! ← Where can I watch The Blackhawks in Chicago?